After global economic crisis, the speeds of economic improvements in new emerging markets and developing countries are faster than that in developed economies, and these two entities have become the major force of world economic recovery. In international shipping market, the global container volume increases dramatically. And China has become the world's biggest country in import and export because of its rapidly developing manufacture. At the same time, the profits brought by economy of scale has attracted attentions from international shipping participants, The container shipping gets advantages from economics of scale in maritime shipping, inland transportation and transshipment. The container shipping companies are interested to increase the vessel size because of increasing the vessel capacity it could make lower cost/TEU. Under this background, the large scale container vessels start to bring out. Today, the mega container vessels, which own transport capacity of over 10000 TEUs per single ship, have been put into use. Although these mega vessels can meet the requirement in current container shipping market, they also make new requests for container terminals all over the globe. These requests are from almost all aspects like geographical position, natural conditions, infrastructures and superstructures. During the competition in the tendency of large scale container vessels, many ports lose their former positions in container shipping market. And many ports which possess all the conditions above become the new core in this time. Yantian International Container Terminal is one of the four international container transfer ports and the container terminal with the highest container throughput in China. Seen from the natural conditions, quality of infrastructures and efficiency of custom clearance, YICT has the potential to become the core container terminal in China or in the whole range of Far East. In Chapter4, I simulate that the world‟s biggest container vessel in the next five years – Triple-E class container vessel from Maersk Line call at YICT to test its terminal capacity (the capacity in berth and container yard, and their service quality) to see YICT‟s ability of serving large scale container vessels. I conclude some advantages and disadvantages of YICT in serving the mega vessels. 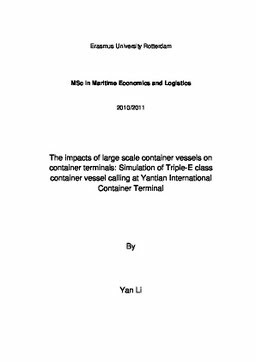 In this thesis, I make suggestions on the development of YICT and, using YICT as an example, analyse the impacts of large scale container vessels on container terminals.